Kids' Directory® is a resource magazine connecting families with businesses offering the goods and services they need for their always-changing family. It is a full-color magazine with durable, high-gloss paper that will keep your interest with its simple format. Plus, with the handy size of Kids' Directory you can easily keep it with you in your purse or glove box. You'll find Kids' Directory in pinpoint locations frequented by parents. Our readers think of us as a lifeline to finding what they need--our advertisers think of us as a solid investment to increase their business! 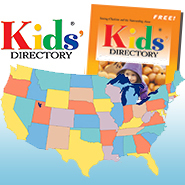 Select your area from the left side of this page to find a Kids' Directory near you. Owning a Kids’ Directory® Could be the Business for You! You do not need to have publishing experience. Instead, we are looking for those who have a sales background and desire to communicate local resources to their community. Own a Kids' Directory® in your area and enjoy the benefits of setting your own schedule and being your own boss! We will guide you in all the steps necessary for you to have your own successful business and achieve financial freedom. Local parents and businesses are waiting for your Kids' Directory®, click here for more information!